This was a change from the usual times to see if people would like an early morning run starting by having breakfast in the downstairs breakfast room at the Albion Hotel this is one of the oldest original Hotels in Auckland. At one stage there was I think one hotel for each 143 people in Auckland. When we arrived John Gardner was waiting to see where to go in the hotel, and he told us to go over the intersection and come back around the lower block as it was a no turn left street, when we came back up he directed us to the pay parking area $5 a day for Sunday, which was good as it saved us driving about looking for a place. Going downstairs we saw Ngaire and Roy who had been on night shift sitting at a table watching the soccer on the big screen TV. You order your breakfast from the selection on the blackboard behind the counter, cereal, fruit, yoghurt, bacon eggs, hash browns, sausages, baked beans etc with toast and coffee or tea which you can have refills off. When prepared they bring it to your table. After everyone had finished breakfast it was decided to make the run a small one, owing to the lack of cars just along the waterfront to Mission Bay. Once we had all arrived and parked we made our way to the old Mission buildings which has been turned into the Mecca Restaurant for coffee, the management made us up a long table inside the original building with its high peaked roof just like being in a church with church like windows. Various forms of coffee made their way to our table, some even came with marshmallows, and Trevor Huggins very kindly announced that he would pick up the bill for the whole group. They have a Brunch menu on display and some very nice plates of food were going to other tables perhaps we could go there for breakfast at some future date. After the coffee we made our way outside on to the walkway along the beach and everyone gradually in their own time made their way along the beach front dodging the passing showers under trees etc. 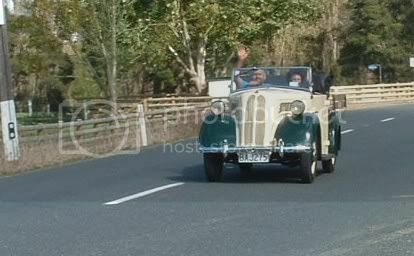 After arriving back in the car park they dispersed on their separate directions homewards. Those attending the monthly run were Trevor and Kiri Huggins and grandson Lorenzo, Ant Kite and Karen Preston, Roy and Ngaire Wilson, John and Janice Gardner (Prefect Ute), and Thelma and Bud Semadeni (Prefect). Terry and Joanna North and daughter Brenda, and Jack Breekveldt who accompanied them, came to the breakfast only, as Terry had some urgent work at home. 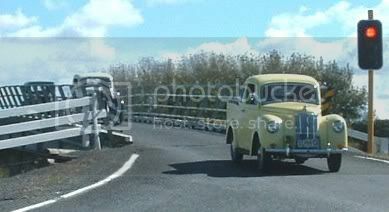 Easter Sunday: drive to Waihi and back. Attracting interest at the historic rail station. Old Jack. He's most impressed with his 12" stroke, but Debra thought the Weight in Working Order was more appropriate!! Easter Saturday: travelling to Coromandel township and back. 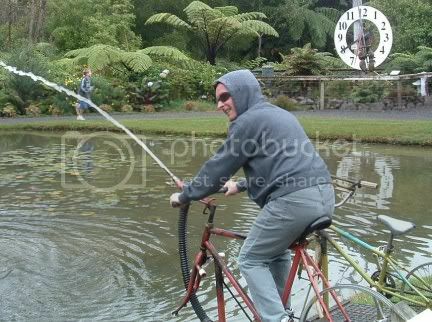 El Presidente going for a ride at the Waiau Waterworks, Coromandel. The Model A club also visited the Waterworks while we were there. Bud & Thelma exiting the carpark. Good Friday: travelling from Auckland to Thames. 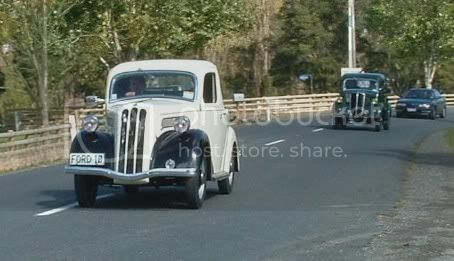 7W ute (Terry, driven by Martin); and Fordson pickup (Terry). 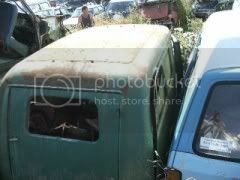 From front to back: 7W ute, Prefect ute (John & Janice), Model Y, Prefect, Anglia ute. 7W ute (driven by Martin) and Model Y (Chris). 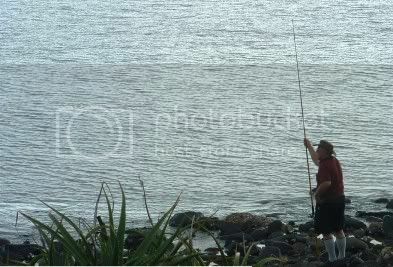 After arriving at Seaspray Motel at Waiomu Bay, Bud tries his hand at fishing. 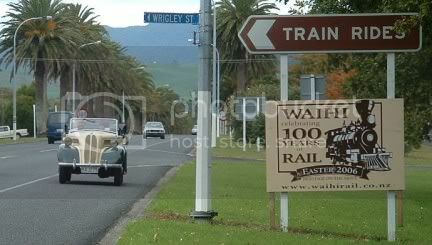 14 April: Waihi Goldfields Railway celebrates 100 years of Rail. 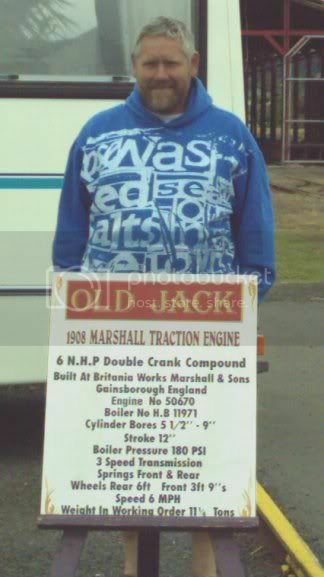 22 April: National Die cast models and old toys fair and swap meet Northcote. 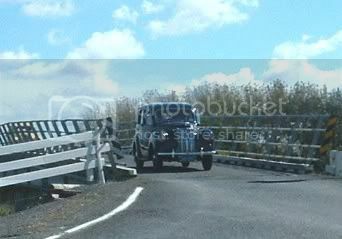 23 April: British and European Day Te Awamutu Raceway. 30 April: British & European Motoring show, Flemington Racecourse, Australia. 07 May: Marineland swapmeet and car display contact Ross (06) 844 7323 or email. 13 May: The annual Wellsford/Warkworth Swap Meet (Sat). 28 May: NSRA Annual Automotive swapmeet and display Spring Street Car Park, Tauranga. 10 June: All British Day at Bruce Mason Centre Nth Shore. 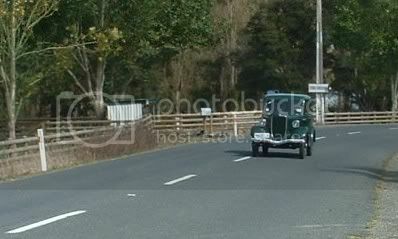 April 2007: The Australian National Sidevalve Rally of Australia, Cootamundra, NSW. 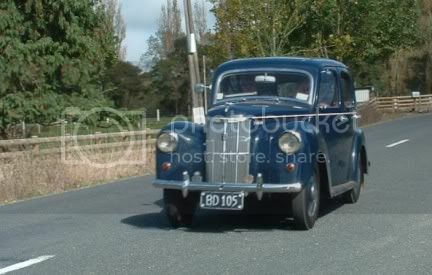 If you would like to take part contact the Anglia Prefect Car Club of Australia, P.O. Box 195 Eastwood, 2122 NSW. or email. An artice regarding an exceptionally rusty Model Y can be found here. I'm surprised there were any salvageable bits at all. Recently Terry North and a friend rode their motor bikes from Auckland to the Main Land going across to the South Island on the interisland ferry; luckily for them it was calm both ways. Just after they came back there was a big storm with huge seas. Terry’s bike was a 1988 350 Jawa which apparently gave no trouble on the trip. 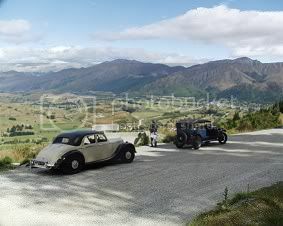 Terry went down as far as Queenstown where he stayed with former club members and friends Roger and Kay for a few days. 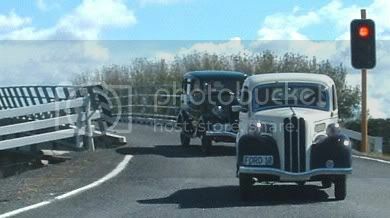 On the way back he made a point of going to a Wreckers yard in Oamaru where he had heard there was an unusual Fordson Van. This van is unusual as it must have been made especially for the previous owner a baker; it has two doors on one side and one on the other plus the rear door. There are windows in the side doors. It is lined on the inside also and Terry considers though it has been there for some time (the wrecker thought it was too good to wreck and just stored it) that it is restorable. The company that owns it is AUTO LAND DISMANTLERS, Owner Richard Cromwell, Main South Road, Oamaru ph (03) 434 9838, or email. 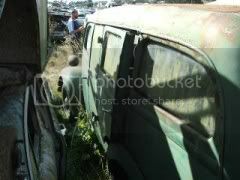 If you are interested in this vehicle he would accept a fair price as he would like to see it restored. Hopefully you can get an idea from these photos that Terry tried to get the best angles to show you the features. If any member acquires this for restoration let the club know, so others in the club can watch your restoration progress. Turner's first classic car auction for the year is to be held on 11 March starting at 2:30pm, at their Penrose branch. There's nothing of particular note for us Ford 8 & 10 fans, and over half of the vehicles are post-1980. Can someone tell me since when did a 1993 Lexus became a classic?? This was on a long week end this year perhaps that is why there did not seem to be as many cars as usual. The weather was fine with a stiff breeze so we didn’t put the Gazebo up this year. This year the club took some swap meet items in this was done by Terry who collected them from the parts shed and towed them in behind his little truck, his sister in law driving in his other display vehicle. He set up the stall and manned it for a lot of the time other members taking turns to give some help so he could look around. After the meet the remaining items were taken back to the parts shed by him a big effort on his part. Many years ago we owned a Vauxhall 10 and the spare front and rear windscreen glass was there which a greatfull Vauxhall member took home. 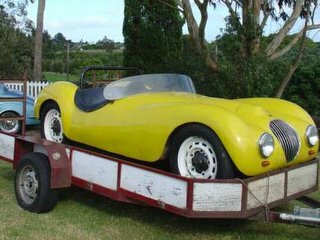 A lot of interest was given to the Ford Special of Roger Birchall he has only just rejoined after a long absence after reacquired the special which he sold a number of years ago, it has been for some of the time down the South Island. His brother showed up later with a 1907 International that also attracted quite a crowd about it. We have some one looking for a nice car to buy. Eric Welch brought over a gentleman for a form and told him all about the club. Our display was a lot smaller than usual we had two utes and a small truck and two Prefects turn up plus the Special. This is getting bigger and bigger each year there are a huge amount of stalls and swapmeet sites it takes a long time to walk around them most people seem to go out and look, then go out again. The main swapmeet is on Saturday for the serious collector, the car show for clubs is on the Sunday, the Hot Rods are in the sheds away from the elements. This year the weather on the Sunday was warm with a little breeze, when we arrived at the showground’s from the meeting site there were already two cars from the club there, and we parked as close as we could to them. There is a band that plays on the stage and a variety of food stalls, the grounds are licensed so the liquor facilities do a good trade. This year there were several helicopters giving rides for I gather $45 for 6 minutes there were long queues waiting. A rocket car in the arena was started up with a lot of noise for a few minutes. 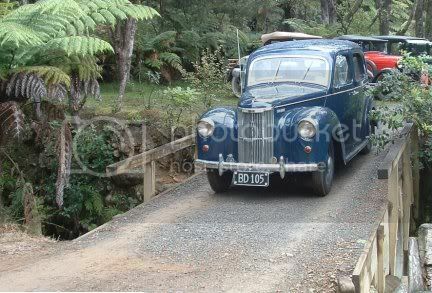 I think almost all families in NZ must have owned a Prefect at some time by the comments you hear, "My Grandma or Grandfather had one of these." "We used to go on holidays in these, where did we all fit plus the luggage?" Representing the club with their club cars were: Berni - Popular, Rod with Tracy's Prefect, Peter and Janice - Prefect, Dennis - Prefect, Bud and Thelma – Prefect. Galaxy of Cars is being held at Motat (Motions Rd Entrance). Drivers of displayed vehicles are free, passengers $8 Club members bringing cars to display, please be on the site by 9.45am. Club members meet at the corner of Red Hills Rd and Don Bucks Rd @ 9am. The sudden shower at the end rather spoilt the after events in the park as most people headed home with their children instead of coming around for the lolly scramble and carol singing etc. There were a lot of hot rods all making a great deal of noise; some veteran cars the oldest seemed to be 1905; the Vauxhall club was there and quite a few older style TQ’s Phil Johnson had two on a trailer, the Scottish pipe band played well, a number of RSPCA dogs, some floats with angels etc and the dressed up Kiwi Bird. I think there were more people in the street than usual all the children were saying "toot the horn toot the horn" so there was a lot of noise from the different vehicles from little squeaks to huge air horns. After a while we made our way around to Jim Boag’s for the BBQ, which was as usual a very pleasant event, most people bring along some food to share, salads, cake, homemade bread, meat sausages, nuts and raisins, etc. The Shaw’s were there already; Gavin Welch who organized the parade with Angeline, Martin Healy, and Bud and Thelma went. 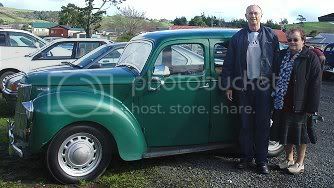 The parade had two members of the club in their club cars Ken Carly in his Y and Bud and Thelma Semadeni in their Prefect ... Ken did not go to the BBQ as he lives at Pukekohe and had been in hospital recently so he went home.